It is a gregarious luxury car worth $12.8 million manufactured by Rolls-Royce Motors in the United Kingdom. It was manufactured in 2017 and conquered the first position for the world’s most expensive automobile. The Rolls Royce Sweptail is hand-built. Its design and manufacturing were inspired from coachbuilding of the 1920s and 1930s. This car was commissioned bespoke at the request of a super-yacht and aircraft specialist who had unique ideas of yacht-like luxuries in his mind. The owner of the car was very specific to his requirements. He wanted the panoramic glass on the roof with the 2-seater luxury coupe. It took 4 years to complete the building of this car. That means that the customer request happened in late 2012 or 2013. This British company has been known for its luxuries inspired from aircraft and now even yachts! Such is their engineering and designing of luxury which comes with a humongous price tag that even customers don’t mind paying. Under its large bonnet lies 6.6-litre V12 engine and can reach a speed of 150mph. It gives a torque of 531rpm and horsepower of 453rpm. The steering wheel is wrapped with leather. The seats are wrapped in Moccasin and Dark Spice leathers which reflects true gentleman’s luxury. It is a high-performance car manufactured by the German company Maybach-Motorenbau GmbH. It was unveiled for the first time in Berlin in 2005. It is a 2-door coupe. 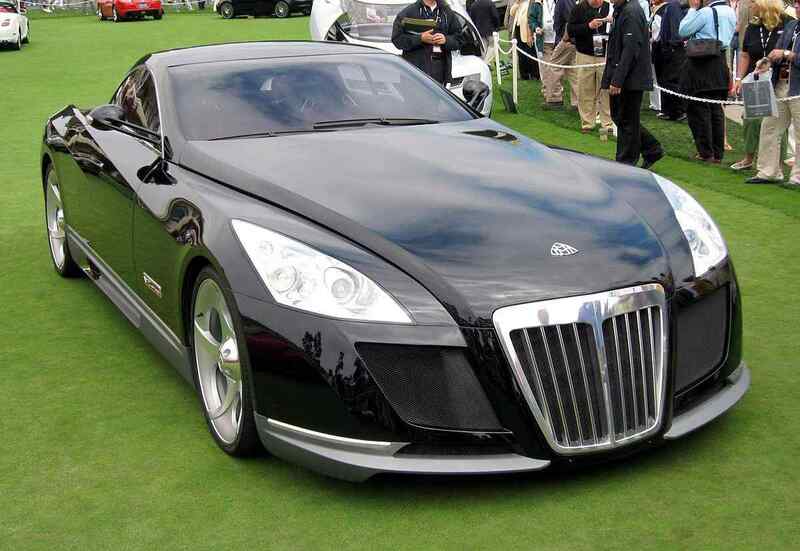 The car is powered by a twin turbo 5.9litres, 5908cc V12 engine made by Maybach. It has a top speed of 218mph (350km/h). All the 4 wheels are of alloys in diameter of 23 inches. The brakes are vented discs and the car is equipped with ABS (Antilock- Braking System). Dark black and red leathers, neoprene, glossy black carbon fibre, and aluminium accents are used in the car’s interior. According to TopGear, the car was purchased by rapper Birdman in 2011 for $8 million. Jay-Z featured this car in his video song ‘Lost One’. ‘Trevita’ is a Swedish abbreviation which translates to ‘three whites’. Koenigsegg CCXR Trevita is a limited-edition car. The company’s carbon weave work is renowned worldly for its uniqueness, comfort and quality. The company has developed a solution uniquely for this car to be applied on the carbon work which would turn the black dark colour of car to a sparky, silvery white. When sunlight hits its surface, it seems and shines as though tiny diamonds are infused in the carbon fibre. The car has double carbon rear wing, Inconel exhaust system, carbon ceramic brakes with ABS, airbags, F-1 paddle-shift gearbox, tire-monitoring system, and a hydraulic lifting system. Originally, limited 3 cars were only to be manufactured to keep it exclusive, and even the white carbon fibre made the manufacturing of the car extremely difficult and time-consuming. However, the company ended up in manufacturing only two cars. It contains 4.8L V8 engine and its top speed 410+km/h. Its acceleration is 0-100km/h in 2.9s. It has a fuel capacity of 70 litres. It’s worth $4.8 million. This is a limited-edition high performance $4.5 million super sports car. It is manufactured by Italian manufacturer Lamborghini. Its aerodynamic design guarantees stability in sharp edge curves on road and gives an experience like sports prototype. It is specially designed for sports-driving lovers. It is named after the famous fighting bull ‘Veneno’ of 1914, who killed its matador. ‘Veneno’ also means venom in Spanish. It comes with a 6.5 litre aspirated V12 engine, can reach a speed of 355km/h and gives a torque of 5,500rpm. Its aeronautics gives you the indescribable feeling of flying on the road. This car is Lamborghini’s racing prototype for the road. The design of the car in front is such that there are maximum airflow and improved downforce. The design is inspired by LMP1 cars and racing cars. The vented engine improves cooling of the engine and the aerodynamic elements give the track-focused characteristics. Lamborghini built just 5 of them – one for factory testing, one retained in the factory, and three for customers with complete customizations. It is a limited-edition sports car manufactured by a UAE based company W Motors in collaboration with Lebanese and Italian engineers. The company was found in Lebanon in 2012. It is the first sports car to be designed and manufactured in the Middle East. Ralph R.Debbas describes this car as “A Modern Machine with a touch of humanity.” The car is inspired by the first werewolves of history. It is the first car to have jewels embedded on its headlights i.e. it contains titanium LED blades with 420 diamonds, yet customers have a selection of jewels such as rubies, sapphires, yellow diamonds, etc. It has gold stitching on the seat. The company manufactured only 7 of these cars. One was for the Abu Dhabi police force and other six were for customers. It is powered by a 3.7-litre twin-turbocharged flat-six engine which gives 581.6kW of power at 7100rpm. The engine is mid-rear mounted which gives its weight to the rear part of the car. It is worth $3.4 million. This $3.4 million car was originally designed by the German Volkswagen group and manufactured by Bugatti in France. This car is the successor of Bugatti Veyron Vincero. The new updates include a comprehensive facelift, the shortened bonnet, modified wings and a striking apron. There are LED daytime running lights and a stylized ‘V’ on the bonnet which pays homage to VIVERE. It can reach the speeds of 254mph. It is powered by 8 litre W16 engine producing 1,200hp. It is one of the most expensive cars in the world. It is a car manufactured by Italian design house Pininfarina. This car is a coach built Barchetta (a term used by Italian manufacturers to refer to a two-seat car with an open or a convertible roof) which is based on mechanical underpinnings of Ferrari 458 Spider. It is named after Sergio, who led Pininfarina for 40 years. It is a compact concept-based car. It also has a mid-rear engine position. The engine is 4.5 litres V8 type. It can reach 0-62mph in 3.4s and maximum speed is of 320 km/h. Ferrari built six of these cars and sold it to handpicked customers for $3million. It is a sports car developed by France based company Bugatti. It is a successor of Bugatti Veyron. The car is named after a Monegasque racer Louis Chiron. It was first shown in Geneva Motor Show on 1 March 2016. It has an 8.0 litres quad turbocharges W16 engine. The engine has a power output of 1,103kW at 6700rpm. This car can accelerate from 0-97km/h 2.4s according to the manufacturer and listed as one of the fastest cars in the world. Its speed is electronically limited to 420km/ has no tyre currently manufactured will be able to handle the stress at the top speed the Chiron is capable of achieving. Its top speed without the limiter is 465km/h, however, the CEO of the company stated that they are not interested in a top speed run. The first 200 cars were sold before the first delivery of the car. It is worth $2.9 million. One of the most expensive cars in the world is manufactured by Marnello based Italian company Ferrari. The FXX K is a research and development vehicle based on Marnello’s first hybrid La Ferrari. The K stands for kinetic energy recovery system (KERS) which is used to maximize performance. It was designed by Marco Fainello, Flavio Manzoni and architect Evan Rodriguez. The car is powered by rear-mid naturally aspirated 6.3 litres V12 engine which gives the total power output of 1036hp and engine power output of 848hp. Its total 40 units are produced. It is worth $2.7 million. It is an electric hybrid car by collaborative manufacturers like Aston Martin, Red Bull Racing, and several others. It is a limited version of the car. The car-makers claim it to be the fastest legal street car in the world. Its design was helped by Adrian Newey who is Red Bull Racing’s chief technical officer and the world’s most renowned and successful British F1 designer. It contains 6.5 litres naturally aspirated V12 engine which produces 1,130hp at 10,500rpm. It has an acceleration of 0-60mph in 2.5s. It is worth $2.6 million. These are the most expensive cars in the world. Do post your comments.